Politics played a hand in the decision by Standard & Poor’s, Moody’s, and Fitch Ratings to downgrade Russia’s credit rating, and isn’t an accurate reflection of the country’s economy, says Guan Jianzhong, head of China’s Dagong rating agency. The so-called ‘Big Three’ rating agencies have all downgraded Russia’s sovereign credit rating. Most recently, S&P cut Russia to ‘BB+’ or ‘junk’ status, which is a sign for investors to stay clear. All three major ratings agencies are headquartered in the United States. "We believe that the downgrades of Russia’s rating by the Big Three rating agencies [Standard & Poor's (S&P), Fitch and Moody's] … are politically motivated," Guan Jianzhong, president of China’s Dagong rating agency said in an interview with TASS on Wednesday. "I believe, there are no preconditions for these downgrades," Guan added. 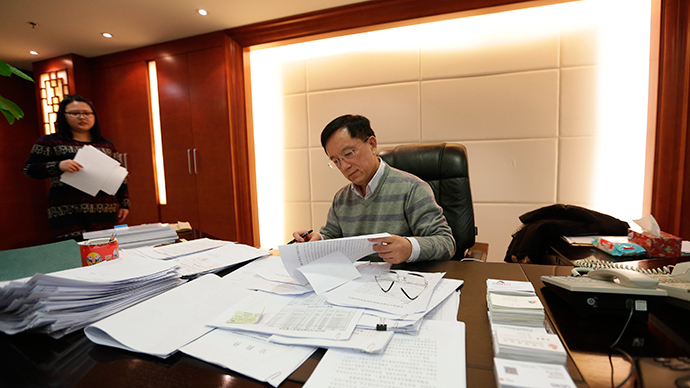 Dagong is one of China’s biggest debt-rating companies. It rates Russia’s sovereign credit at ‘A’, a top investment grade with a ‘stable outlook’. Following S&P’s downgrade on January 26, Russian officials cried foul accusing the agency of carrying out Washington’s political agenda. The Russian economy has been hit hard by falling oil prices, as well as Western-led sanctions over the Ukraine conflict. The US and Europe have sanctioned dozens of Russian-state owned energy, finance, and defense firms over political differences in Ukraine. "The current crisis in Russia has been caused by the Western countries’ sanctions rather than domestic factors," Guan added. Dagong’s ratings are only recognized in China and were established in 1994. It is one of the first agency’s to question the legitimacy of the ratings by the ‘Big Three’. Dagong has downgraded the United States to ‘A-‘ creditworthiness due to the country’s enormous $17 trillion debt. In contrast,Russia has a public debt of 9.2 percent of its GDP, where the US has 72 percent. Across the EU, several countries have public debt more than 100 percent of GDP. "In these countries, unlike Russia, the scale of loans has exceeded the potential of national wealth production, resulting in a ‘bubble’. This crisis has spread across the world due to the policy of quantitative easing and switching on the printing press. All the countries have been forced to pay the price for this," Guan Jianzhong said. Despite US and EU sanctions, the Dagong rating agency has given Russia’s Gazprom, the world’s largest gas producer, the highest AAA credit rating with a long-term stable outlook, saying it has a low level of dollar-denominated debt, strong financials, and has the highest level of profit of all energy companies worldwide.